Maxwell Forest Farley was born Mar. 21, 1886 in Adams Co., Iowa, son of Joseph Blake Farley and Laura Belle McCloud, and died Feb. 21, 1961 in Omaha, Douglas co., Nebraska. He married Sadie Draney in 1920. 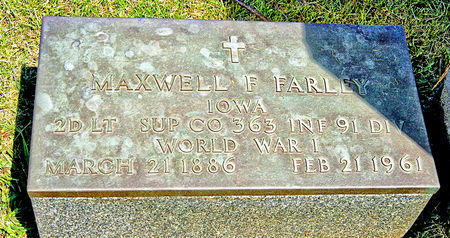 Searching for MAXWELL FOREST "MAX" FARLEY in Taylor County Iowa?